"The ice age comes to the Suncoast!" & Suncoast Suns.com has come of age! Welcome to the official website dedicated to the memory of the Suncoast Suns Hockey Club of the Eastern Hockey League & Southern Hockey League. 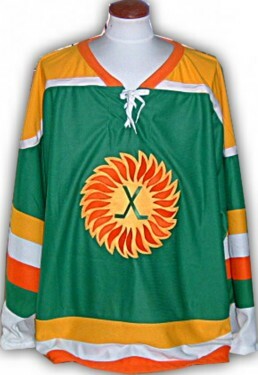 The Suns played the 1971-72 and 1972-73 seasons in the EHL and in their final season, from October to December 1973 in the SHL. The Suns combined record was 66-93-21 in 180 regular season games. The 1972-73 season saw the Suns set highs in games played 76, wins 30, and losses 37. The Suns never had a winning season, although they did reach the playoffs. 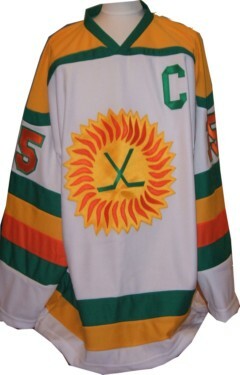 Shown here are a Suns reproduction home and away jersey. The dark road jersey on the left and the white home jersey on the right. The Bayfront Center shown below was the Suns home for the two plus seasons of their existence. Help support this site with a donation through the PayPal link above. Corporate Sponsorship is also available. For more information contact us below.